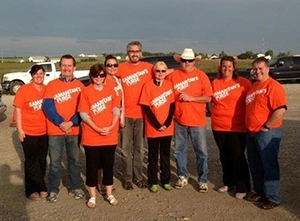 Members of the IBAA Executive and office staff decided that, after our annual planning meeting this year, we would forego a round of golf in favour of volunteering in High River on August 15, 2013. The nine-member team was assigned three separate projects for the day, each very different, and each a glimpse into the destruction suffered by victims. We worked with Samaritan’s Purse, whose volunteers flew in from all across the country to help clean, rebuild, console, and generally do whatever they could to help get High River back to normal. For the first job, we donned the latest in haute couture—Tyvek suits, accessorized with respirators and safety glasses. It was a hot, muggy day, so it was sort of like being wrapped in a plastic bag and forced to do hard labour in a hot, steamy sauna. The first task was to clear the top level of a townhouse condemned as uninhabitable. It’s tough to throw out what might have been a child’s first teddy bear, first artwork, and first report card. When we looked around at the pile of belongings now destined for the garbage, we realized that we were throwing out someone’s entire life. As you might imagine, the homeowner was so distressed she couldn’t bear to be there. Next, the team split into two groups. Group One spent three backbreaking hours shoveling muck from under a deck and over a lawn. The ground was still damp and the dirt was the consistency of dense wet clay—sort of like shoveling heavy thick sludge. With a team of seven working tirelessly, the contaminated muck was removed. We lost count of how many wheelbarrows were filled and lugged away. The homeowner was an older woman for whom the help was a huge burden lifted because she had no other way of clearing the mud from her property. Group Two was charged with washing walls in a bungalow that saw eight feet of water destroy the entire lower level. We found out from the homeowners that they had only just got hot water back the day before we arrived—almost two months after the flooding. On the day of the disaster, the woman left for work as usual—two weeks before she was to retire. She ended up not returning home due to the evacuation notice. Her husband, on the other hand, did come home mid-day. He no sooner got into the house than water started to enter. It rushed in so quickly he became stranded and had to be rescued by boat. For several hours, they were separated, neither one knowing the fate of the other. All in all, it was an exhausting day but well worth the effort. I think we all realized that, while much is still to be done in High River, we helped three families continue their road to recovery. It felt so darn good—not just to help but also to work as a team on behalf of IBAA members everywhere.